If you’re perfectly okay with a bit of jitteriness and nausea with the first few doses you take, OxyECA Black is a good fat burner to pick if you’re looking for effectiveness and value. However, if you're trying to zero in on a potent fat burner that doesn't have any side effects at all, getting your hands on Commander Go Pack is an option you should go for. Realizing all your bodybuilding goals is going to be next to impossible if you don’t start things off by eliminating unwanted flab. No matter how intense your workout routines are or perhaps how strict your diet regimen is, you won’t achieve the muscle cuts and definitions you’ve always wanted if you don’t have a surefire fat loss plan lined up. One product that claims to help pick up the pace on getting rid of undesirable fat is OxyECA Black. It is formulated to directly target the primary drivers of fat loss so you’ll start blasting away flab in no time. Join me as I subject this fat burner to a rigorous review to see if this one is really worth trying. How Does OxyECA Black Work? Manufactured by Lecheek Nutrition, OxyECA Black is designed to trigger four key effects in the body when taken, namely enhancing lipolysis, curbing cravings, boosting the mood and mental focus as well as jumpstarting energy levels. When these factors are optimized, your body will be able to burn a much higher amount of fat in a shorter period of time. N-Methyl-L-Tyramine HCL – Sure this compound’s name is quite a mouthful, but its fat loss benefits are really impressive. N-Methyl-L-Tyramine HCL is basically derived from a trace amine of an amino acid called tyrosine, which stimulates the brain to churn out more norepinephrine in the body. Besides optimizing blood circulation to the muscle tissues to help keep you going even during the harshest workouts, N-Methyl-L-Tyramine HCL also has the ability to improve the mobilization of stored fat in the system to be used as energy fuel during metabolism. Acacia Rigidula Extract – Acacia Rigidula Extract is sourced from a perennial shrub that is endemic to the regions of Central Mexico and South Texas. It contains numerous bioactive compounds like theobromine, methylsynephrine and N-methyl-phenylethylamine that have been seen to help enhance lipolysis, speed up the burning of fat deposits as well as suppress the appetite. Clinical tests also show that Acacia Rigidula Extract has positive effects in terms of intensifying metabolic activity in the body during periods of rest. Hordenine HCL – Getting rid of unwanted fat to realize the ideal muscular cuts and definitions you want can leave you feeling drained and unmotivated sooner or later. Derived from N-methyltyramine, Hordenine HCL is a type of alkaloid and adrenergic-like compound that is capable of inhibiting the activity of stress hormones in the system not just to help boost energy levels, but also uplift the mood and improve mental concentration. Hordenine HCL is also closely studied by experts as a possible noradrenaline reuptake inhibitor. Dandelion Powder – Dandelion Powder comes from a flowering plant that is predominantly abundant in Asia, Europe and North America. Besides being used in traditional folk medicine as a digestive aid, the leaves, stems and flowers of this plant that are used to make Dandelion Powder also contain lots of useful compounds that give it a mild yet lingering diuretic effect. Dandelion Powder is also packed with detoxifying agents that help keep diseases and inflammations at bay. 1,3,7-Trimethylxanthine – 1,3,7-Trimethylxanthine is essentially the scientific name of caffeine, which is considered as one of the most effective substances when it comes to perking up the body physically and mentally as well as promoting the metabolism of fatty acids and increasing the production of energy-boosting adenosine triphosphate (ATP). Take one (1) capsule of OxyECA Black on an empty stomach upon waking up, followed by another capsule in the afternoon. Do not take more than 3 capsules of OxyECA Black within a 24 hour period. Do not use OxyECA Black if you are taking medication for cardiac arrhythmia, blood pressure issues, stroke and anxiety problems. For most people who have tried using OxyECA Black, the only notable side effects they experienced were slight jitteriness and mild nausea during the first few doses. I’ve always thought that the best way to see if a certain product can really do what it claims is checking out what users are saying about it – and OxyECA Black has gathered quite a lot of raves from people who already gave it a go. 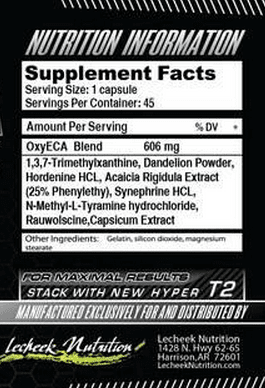 The ingredients that this fat burner is loaded with aren’t shabby in any way at all, too. Apart from being commended for its effectiveness, many users have also pointed out that OxyECA Black is one of the most reasonably-priced fat burners available these days. You are already getting 45 capsules by just dishing out $26.99. So if you’re perfectly okay with a bit of jitteriness and nausea with the first few doses you take, OxyECA Black is a good fat burner to pick if you’re looking for effectiveness and value. However, if you're trying to zero in on a potent fat burner that doesn't have any side effects at all, getting your hands on Commander Go Pack is an option you should go for. You can click here to check it out right now.